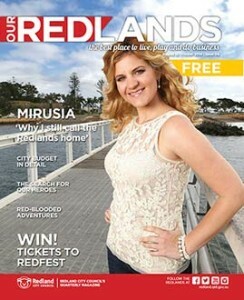 The latest edition of Council’s free Our Redlands magazine is loaded with stories about philanthropic and talented Redlanders, community news and events, and what’s happening in our City’s arts world. You will be inspired by one local’s work to help the “poorest of the poor”, find out why international stars such as Mirusia Louwerse still call the Redlands home and how you can help trace lost heroes. There’s also the annual budget report as well as news about significant local projects and Council works. You will find it in the Redland City Bulletin on Wednesday 30 July, as well as at Council Service Centres, libraries and major shopping centres.